I have been to many Flamenco festivals. Over the years I have seen performances in different locations around Andalusia. Some have thrilled others have dissapointed. In March 2014 I went along to Templo del Flamenco in Granada with a group for dinner. My expectations were low. 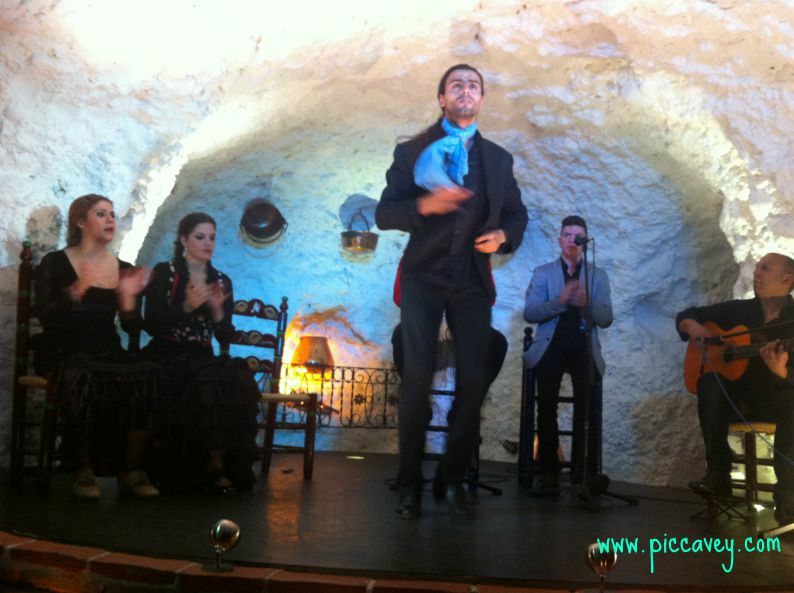 The usual area for Flamenco in Granada tends to be the Sacromonte. Along this road lined with caves, on the camino de Sacromonte families have run shows and tablaos for years. Their businesses often span several generations. The Templo del Flamenco, well I hadn´t heard of this place. 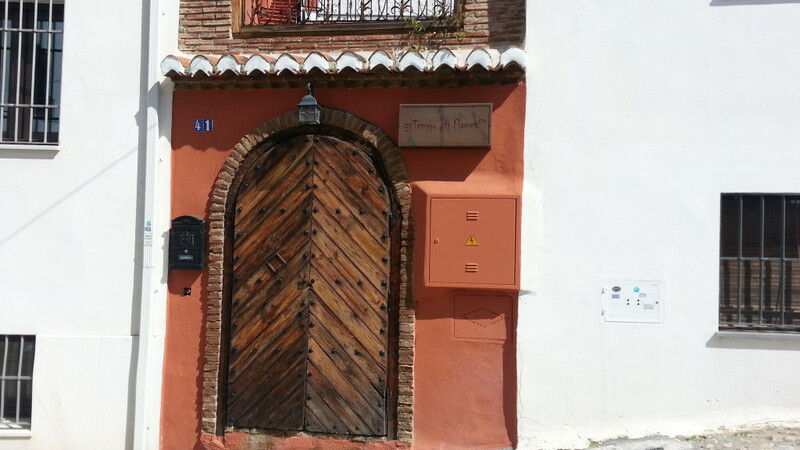 Situated a short walk up from Puerta Elvira. This was the lower part of the Albaicin, not typical Flamenco district at all. To reach it I climbed some unlevel cobbled steps. At the top of the steps, just to the left, was the Templo del Flamenco. From outside it didn’t look much. A small wooden door and a small sign were the only signs that we were in the right place. However when we walked inside I was not disappointed. This building used to be an old chapel many years ago. I could imagine this set up for religious services centuries before. This previous use also reveals why it has its current name of temple. As we walked inside the coolness of the natural cave enveloped us. A large entrance hall lead into the bar area, where out host for the evening welcomed us. We then walked through the large space towards the stage, where our tables were set for dinner. The stage lit with care, was all set, ready for the performers. 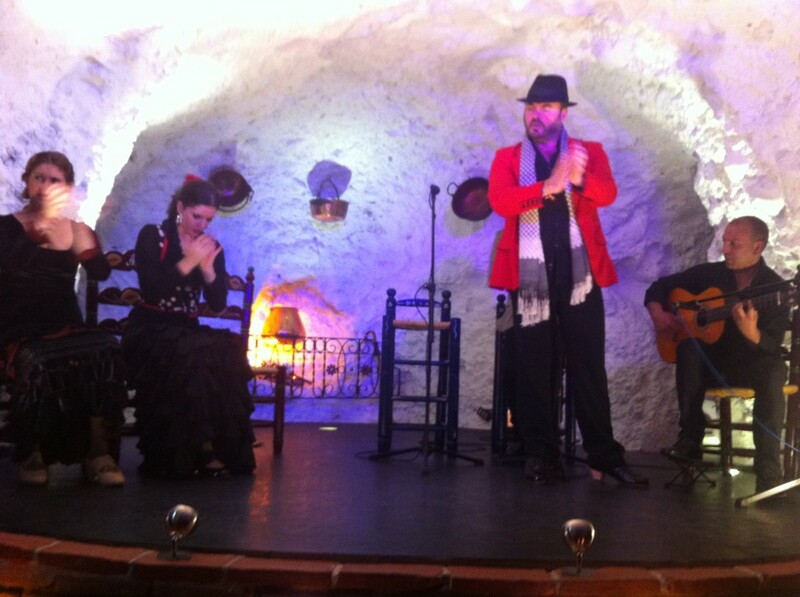 At first glance the Templo del Flamenco looked like a typical gypsy cave. Red polka dot curtains hanging and copper bowls lining the walls. Although looking more in detail, I began to notice that decoration was tasteful interior decoration. The decor was tradition style but includes modern details too, all finished to a high standard. Not long after the opening dance the food arrived to our tables. The portions were more than generous. When I saw my starter, I realized that just that dish would be enough for my dinner! All the food was delicious, much better than I´d expected. One of the specials that night was a shellfish soup that everyone raved about. I made an effort to finish my three courses. In Flamenco tablaos offering food, the focus is usually on the show rather than the food. Quality can be mediocre or substandard. Here I didn’t have that problem. 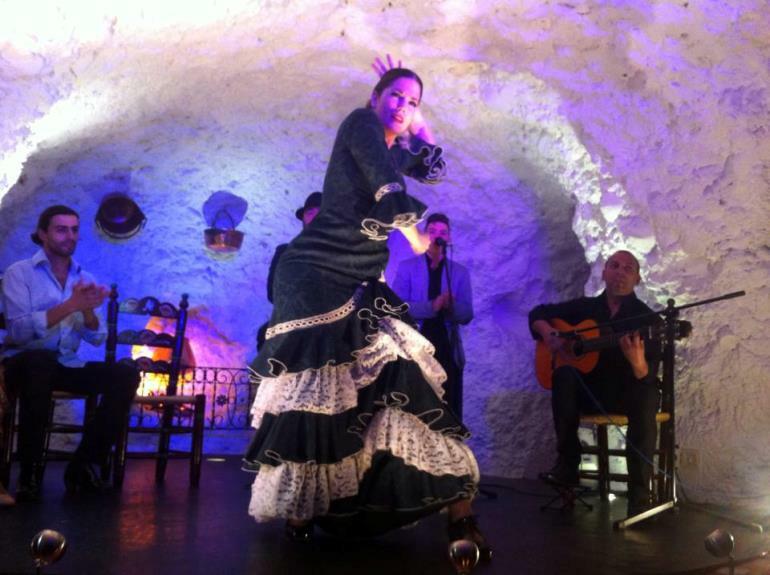 My attention was divided between good food, wine and the breathtaking flamenco just a few meters from me. One of the highlights of the performance that night was a solo piece sung by the young singer, who was just 16 years old. He sang a song as a tribute to the recently deceased Paco de Lucia. A Spanish guitarrist known worldwide. Silence fell in the room and the music was quite moving. This kind of spontaneity is what makes an evening of Flamenco so special, improvisation is an important part of this dance too. Recognised in 2010 as UNESCO’s list of Intangible Cultural Heritage of Humanity this long-standing tradition in Andalusia creates a unique atmosphere. The piece was a composition by Pepe de Lucia, the brother of Paco de Lucia. If I remember well, the song was Al Alba. I have to say that this show was authentic flamenco. Not the standard dances set up for tourist groups which I have seen in some places. As the show continued we saw all four dancers in different styles of songs, a few upbeat ones we added too. There were even costume changes. Some of the moves are pure improvisation. Moves created by the artist as they react to the music there and then. Sharing with the audience a performance with soul. The Spanish call this Duende. Not just mechanical dance moves practiced and repeated over and over. The moves were vibrant and full of sentiment. Later on, after the show, I managed to speak to the owner Antonio Vallejo. I found out that the Templo del Flamenco had been running for 2 years. They had taken a lot of care in the building work and furnishing to set the place up. Antonio, is also the Creative director at La Chumbera in the Sacromonte. Another place with a great reputation in Flamenco circles. I know that the shows there are authentic and good value for money too. So clearly I was in good hands. The Templo del Flamenco is a recommended stop for anyone interested in seeing real Flamenco, whether you have seen it before or are Flamenco junkie. If you are planning a visit to Granada soon or even live here this was a good evening in the lower Albaicin. Thanks for sharing that evocative memory Paul, what a party that would have been..
Sacromonte is really NOT the place to be for flamenco. 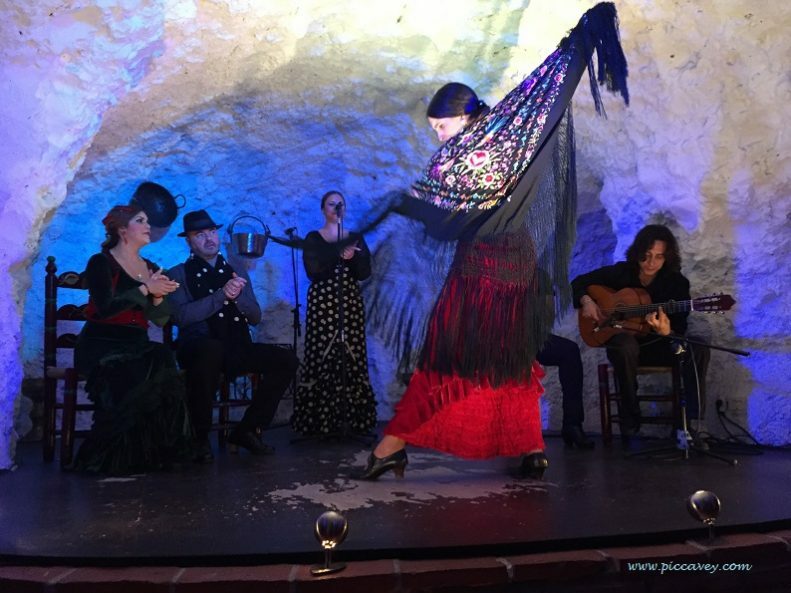 The hords of tourist and the quality of flamenco in Sacromonte are terrible let aside the aggression with which you might be approached by owners of so called flamenco bars. La Chumbera which is right at the end of the Sccromonte road has some of the best shows on offer in for 6 euros on Saturday night in the Autumn season. 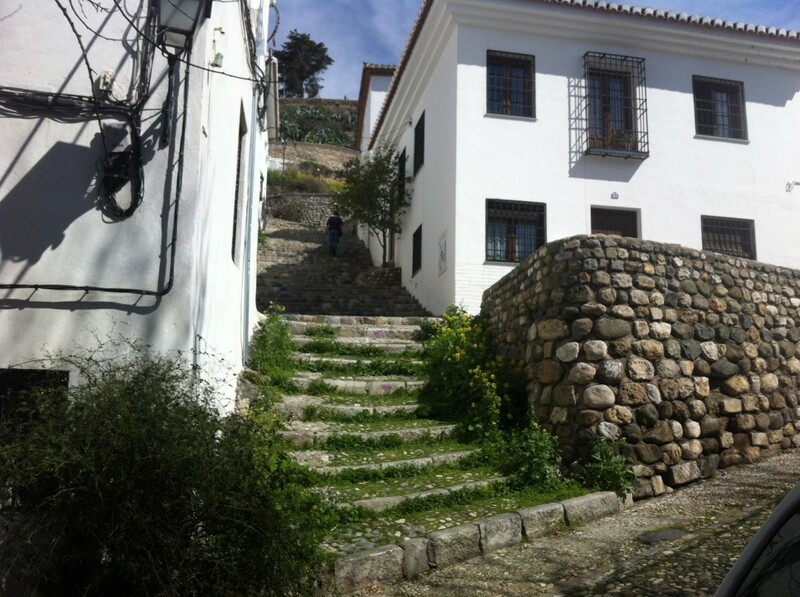 Maria la Castañera in the Sacromonte is also a great place but the shows are not regular. For visitors I think it´s really important that the get good information and don´t just wander along up there.. I too am often asked where the best place is to go and see ‘proper flamenco’ in Granada and I always say Jardines de Zorraya, which I have been to a couple of times but I’m not really a huge fan myself. This place looks fabulous though! If you come to Granada do not hesitate to visit the best flamenco school ´Contradanza Granada´ in the city centre with top-notch facilties.